1 Chapter 1: What Is an Information System? describe the basic argument behind the article “Does IT Matter?” by Nicholas Carr. If you are reading this, you are most likely taking a course in information systems, but do you even know what the course is going to cover? When you tell your friends or your family that you are taking a course in information systems, can you explain what it is about? For the past several years, I have taught an Introduction to Information Systems course. The first day of class I ask my students to tell me what they think an information system is. I generally get answers such as “computers,” “databases,” or “Excel.” These are good answers, but definitely incomplete ones. The study of information systems goes far beyond understanding some technologies. Let’s begin our study by defining information systems. As I stated earlier, I spend the first day of my information systems class discussing exactly what the term means. Many students understand that an information system has something to do with databases or spreadsheets. Others mention computers and e-commerce. And they are all right, at least in part: information systems are made up of different components that work together to provide value to an organization. The first way I describe information systems to students is to tell them that they are made up of five components: hardware, software, data, people, and process. The first three, fitting under the technology category, are generally what most students think of when asked to define information systems. But the last two, people and process, are really what separate the idea of information systems from more technical fields, such as computer science. In order to fully understand information systems, students must understand how all of these components work together to bring value to an organization. Technology can be thought of as the application of scientific knowledge for practical purposes. From the invention of the wheel to the harnessing of electricity for artificial lighting, technology is a part of our lives in so many ways that we tend to take it for granted. As discussed before, the first three components of information systems – hardware, software, and data – all fall under the category of technology. Each of these will get its own chapter and a much lengthier discussion, but we will take a moment here to introduce them so we can get a full understanding of what an information system is. Information systems hardware is the part of an information system you can touch – the physical components of the technology. Computers, keyboards, disk drives, iPads, and flash drives are all examples of information systems hardware. We will spend some time going over these components and how they all work together in chapter 2. Software is a set of instructions that tells the hardware what to do. Software is not tangible – it cannot be touched. When programmers create software programs, what they are really doing is simply typing out lists of instructions that tell the hardware what to do. There are several categories of software, with the two main categories being operating-system software, which makes the hardware usable, and application software, which does something useful. Examples of operating systems include Microsoft Windows on a personal computer and Google’s Android on a mobile phone. Examples of application software are Microsoft Excel and Angry Birds. Software will be explored more thoroughly in chapter 3. The third component is data. You can think of data as a collection of facts. For example, your street address, the city you live in, and your phone number are all pieces of data. Like software, data is also intangible. By themselves, pieces of data are not really very useful. But aggregated, indexed, and organized together into a database, data can become a powerful tool for businesses. In fact, all of the definitions presented at the beginning of this chapter focused on how information systems manage data. Organizations collect all kinds of data and use it to make decisions. These decisions can then be analyzed as to their effectiveness and the organization can be improved. Chapter 4 will focus on data and databases, and their uses in organizations. Networking Communication: A Fourth Technology Piece? Besides the components of hardware, software, and data, which have long been considered the core technology of information systems, it has been suggested that one other component should be added: communication. An information system can exist without the ability to communicate – the first personal computers were stand-alone machines that did not access the Internet. However, in today’s hyper-connected world, it is an extremely rare computer that does not connect to another device or to a network. Technically, the networking communication component is made up of hardware and software, but it is such a core feature of today’s information systems that it has become its own category. We will be covering networking in chapter 5. When thinking about information systems, it is easy to get focused on the technology components and forget that we must look beyond these tools to fully understand how they integrate into an organization. A focus on the people involved in information systems is the next step. From the front-line help-desk workers, to systems analysts, to programmers, all the way up to the chief information officer (CIO), the people involved with information systems are an essential element that must not be overlooked. The people component will be covered in chapter 9. The last component of information systems is process. A process is a series of steps undertaken to achieve a desired outcome or goal. Information systems are becoming more and more integrated with organizational processes, bringing more productivity and better control to those processes. But simply automating activities using technology is not enough – businesses looking to effectively utilize information systems do more. Using technology to manage and improve processes, both within a company and externally with suppliers and customers, is the ultimate goal. Technology buzzwords such as “business process reengineering,” “business process management,” and “enterprise resource planning” all have to do with the continued improvement of these business procedures and the integration of technology with them. Businesses hoping to gain an advantage over their competitors are highly focused on this component of information systems. We will discuss processes in chapter 8. Now that we have explored the different components of information systems, we need to turn our attention to the role that information systems play in an organization. So far we have looked at what the components of an information system are, but what do these components actually do for an organization? From our definitions above, we see that these components collect, store, organize, and distribute data throughout the organization. In fact, we might say that one of the roles of information systems is to take data and turn it into information, and then transform that into organizational knowledge. As technology has developed, this role has evolved into the backbone of the organization. To get a full appreciation of the role information systems play, we will review how they have changed over the years. In the late 1960s, the Manufacturing Resources Planning (MRP) systems were introduced. This software, running on a mainframe computer, gave companies the ability to manage the manufacturing process, making it more efficient. From tracking inventory to creating bills of materials to scheduling production, the MRP systems (and later the MRP II systems) gave more businesses a reason to want to integrate computing into their processes. IBM became the dominant mainframe company. Nicknamed “Big Blue,” the company became synonymous with business computing. Continued improvement in software and the availability of cheaper hardware eventually brought mainframe computers (and their little sibling, the minicomputer) into most large businesses. In 1975, the first microcomputer was announced on the cover of Popular Mechanics: the Altair 8800. Its immediate popularity sparked the imagination of entrepreneurs everywhere, and there were quickly dozens of companies making these “personal computers.” Though at first just a niche product for computer hobbyists, improvements in usability and the availability of practical software led to growing sales. The most prominent of these early personal computer makers was a little company known as Apple Computer, headed by Steve Jobs and Steve Wozniak, with the hugely successful “Apple II.” Not wanting to be left out of the revolution, in 1981 IBM (teaming with a little company called Microsoft for their operating-system software) hurriedly released their own version of the personal computer, simply called the “PC.” Businesses, who had used IBM mainframes for years to run their businesses, finally had the permission they needed to bring personal computers into their companies, and the IBM PC took off. The IBM PC was named Time magazine’s “Man of the Year” for 1982. Because of the IBM PC’s open architecture, it was easy for other companies to copy, or “clone” it. During the 1980s, many new computer companies sprang up, offering less expensive versions of the PC. This drove prices down and spurred innovation. Microsoft developed its Windows operating system and made the PC even easier to use. Common uses for the PC during this period included word processing, spreadsheets, and databases. These early PCs were not connected to any sort of network; for the most part they stood alone as islands of innovation within the larger organization. In the mid-1980s, businesses began to see the need to connect their computers together as a way to collaborate and share resources. This networking architecture was referred to as “client-server” because users would log in to the local area network (LAN) from their PC (the “client”) by connecting to a powerful computer called a “server,” which would then grant them rights to different resources on the network (such as shared file areas and a printer). Software companies began developing applications that allowed multiple users to access the same data at the same time. This evolved into software applications for communicating, with the first real popular use of electronic mail appearing at this time. This networking and data sharing all stayed within the confines of each business, for the most part. While there was sharing of electronic data between companies, this was a very specialized function. Computers were now seen as tools to collaborate internally, within an organization. In fact, these networks of computers were becoming so powerful that they were replacing many of the functions previously performed by the larger mainframe computers at a fraction of the cost. It was during this era that the first Enterprise Resource Planning (ERP) systems were developed and run on the client-server architecture. An ERP system is a software application with a centralized database that can be used to run a company’s entire business. With separate modules for accounting, finance, inventory, human resources, and many, many more, ERP systems, with Germany’s SAP leading the way, represented the state of the art in information systems integration. We will discuss ERP systems as part of the chapter on process (chapter 9). First invented in 1969, the Internet was confined to use by universities, government agencies, and researchers for many years. Its rather arcane commands and user applications made it unsuitable for mainstream use in business. One exception to this was the ability to expand electronic mail outside the confines of a single organization. While the first e-mail messages on the Internet were sent in the early 1970s, companies who wanted to expand their LAN-based e-mail started hooking up to the Internet in the 1980s. Companies began connecting their internal networks to the Internet in order to allow communication between their employees and employees at other companies. It was with these early Internet connections that the computer truly began to evolve from a computational device to a communications device. In 1989, Tim Berners-Lee developed a simpler way for researchers to share information over the network at CERN laboratories, a concept he called the World Wide Web. This invention became the launching point of the growth of the Internet as a way for businesses to share information about themselves. As web browsers and Internet connections became the norm, companies rushed to grab domain names and create websites. Registered trademark of Amazon Technologies, Inc. In 1991, the National Science Foundation, which governed how the Internet was used, lifted restrictions on its commercial use. The year 1994 saw the establishment of both eBay and Amazon.com, two true pioneers in the use of the new digital marketplace. A mad rush of investment in Internet-based businesses led to the dot-com boom through the late 1990s, and then the dot-com bust in 2000. While much can be learned from the speculation and crazy economic theories espoused during that bubble, one important outcome for businesses was that thousands of miles of Internet connections were laid around the world during that time. The world became truly “wired” heading into the new millenium, ushering in the era of globalization, which we will discuss in chapter 11. As it became more expected for companies to be connected to the Internet, the digital world also became a more dangerous place. Computer viruses and worms, once slowly propagated through the sharing of computer disks, could now grow with tremendous speed via the Internet. Software written for a disconnected world found it very difficult to defend against these sorts of threats. A whole new industry of computer and Internet security arose. We will study information security in chapter 6. As the world recovered from the dot-com bust, the use of technology in business continued to evolve at a frantic pace. Websites became interactive; instead of just visiting a site to find out about a business and purchase its products, customers wanted to be able to customize their experience and interact with the business. This new type of interactive website, where you did not have to know how to create a web page or do any programming in order to put information online, became known as web 2.0. Web 2.0 is exemplified by blogging, social networking, and interactive comments being available on many websites. This new web-2.0 world, in which online interaction became expected, had a big impact on many businesses and even whole industries. Some industries, such as bookstores, found themselves relegated to a niche status. Others, such as video rental chains and travel agencies, simply began going out of business as they were replaced by online technologies. This process of technology replacing a middleman in a transaction is called disintermediation. As the world became more connected, new questions arose. Should access to the Internet be considered a right? Can I copy a song that I downloaded from the Internet? How can I keep information that I have put on a website private? What information is acceptable to collect from children? Technology moved so fast that policymakers did not have enough time to enact appropriate laws, making for a Wild West–type atmosphere. Ethical issues surrounding information systems will be covered in chapter 12. After thirty years as the primary computing device used in most businesses, sales of the PC are now beginning to decline as sales of tablets and smartphones are taking off. Just as the mainframe before it, the PC will continue to play a key role in business, but will no longer be the primary way that people interact and do business. The limited storage and processing power of these devices is being offset by a move to “cloud” computing, which allows for storage, sharing, and backup of information on a massive scale. This will require new rounds of thinking and innovation on the part of businesses as technology continues to advance. Can Information Systems Bring Competitive Advantage? It has always been the assumption that the implementation of information systems will, in and of itself, bring a business competitive advantage. After all, if installing one computer to manage inventory can make a company more efficient, won’t installing several computers to handle even more of the business continue to improve it? In 2003, Nicholas Carr wrote an article in the Harvard Business Review that questioned this assumption. The article, entitled “IT Doesn’t Matter,” raised the idea that information technology has become just a commodity. Instead of viewing technology as an investment that will make a company stand out, it should be seen as something like electricity: It should be managed to reduce costs, ensure that it is always running, and be as risk-free as possible. As you might imagine, this article was both hailed and scorned. Can IT bring a competitive advantage? It sure did for Walmart (see sidebar). We will discuss this topic further in chapter 7. Registered trademark of Wal-Mart Stores, Inc.
Walmart is the world’s largest retailer, earning $15.2 billion on sales of $443.9 billion in the fiscal year that ended on January 31, 2012. Walmart currently serves over 200 million customers every week, worldwide. Walmart’s rise to prominence is due in no small part to their use of information systems. One of the keys to this success was the implementation of Retail Link, a supply-chain management system. This system, unique when initially implemented in the mid-1980s, allowed Walmart’s suppliers to directly access the inventory levels and sales information of their products at any of Walmart’s more than ten thousand stores. Using Retail Link, suppliers can analyze how well their products are selling at one or more Walmart stores, with a range of reporting options. Further, Walmart requires the suppliers to use Retail Link to manage their own inventory levels. If a supplier feels that their products are selling out too quickly, they can use Retail Link to petition Walmart to raise the levels of inventory for their products. This has essentially allowed Walmart to “hire” thousands of product managers, all of whom have a vested interest in the products they are managing. This revolutionary approach to managing inventory has allowed Walmart to continue to drive prices down and respond to market forces quickly. Today, Walmart continues to innovate with information technology. Using its tremendous market presence, any technology that Walmart requires its suppliers to implement immediately becomes a business standard. In this chapter, you have been introduced to the concept of information systems. We have reviewed several definitions, with a focus on the components of information systems: technology, people, and process. We have reviewed how the business use of information systems has evolved over the years, from the use of large mainframe computers for number crunching, through the introduction of the PC and networks, all the way to the era of mobile computing. During each of these phases, new innovations in software and technology allowed businesses to integrate technology more deeply. We are now to a point where every company is using information systems and asking the question: Does it bring a competitive advantage? In the end, that is really what this book is about. Every businessperson should understand what an information system is and how it can be used to bring a competitive advantage. And that is the task we have before us. 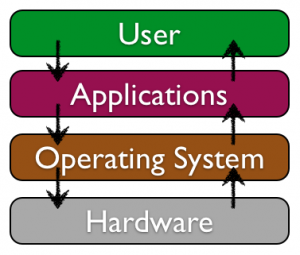 What are the five components that make up an information system? 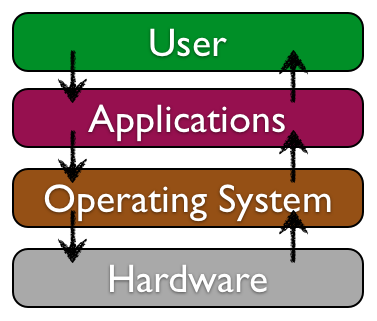 What are three examples of information system hardware? Microsoft Windows is an example of which component of information systems? What roles do people play in information systems? What is the definition of a process? What was invented first, the personal computer or the Internet (ARPANET)? In what year were restrictions on commercial use of the Internet first lifted? When were eBay and Amazon founded? What does it mean to say we are in a “post-PC world”? What is Carr’s main argument about information technology? Suppose that you had to explain to a member of your family or one of your closest friends the concept of an information system. How would you define it? Write a one-paragraph description in your own words that you feel would best describe an information system to your friends or family. Of the five primary components of an information system (hardware, software, data, people, process), which do you think is the most important to the success of a business organization? Write a one-paragraph answer to this question that includes an example from your personal experience to support your answer. We all interact with various information systems every day: at the grocery store, at work, at school, even in our cars (at least some of us). Make a list of the different information systems you interact with every day. See if you can identify the technologies, people, and processes involved in making these systems work. Do you agree that we are in a post-PC stage in the evolution of information systems? Some people argue that we will always need the personal computer, but that it will not be the primary device used for manipulating information. Others think that a whole new era of mobile and biological computing is coming. Do some original research and make your prediction about what business computing will look like in the next generation. The Walmart case study introduced you to how that company used information systems to become the world’s leading retailer. Walmart has continued to innovate and is still looked to as a leader in the use of technology. Do some original research and write a one-page report detailing a new technology that Walmart has recently implemented or is pioneering. Information Systems for Business and Beyond by Dave Bourgeois and David T. Bourgeois is licensed under a Creative Commons Attribution 4.0 International License, except where otherwise noted.